Early riser or morning snoozer? Does it really make a difference? Today we’re chatting up ALL about morning routines. 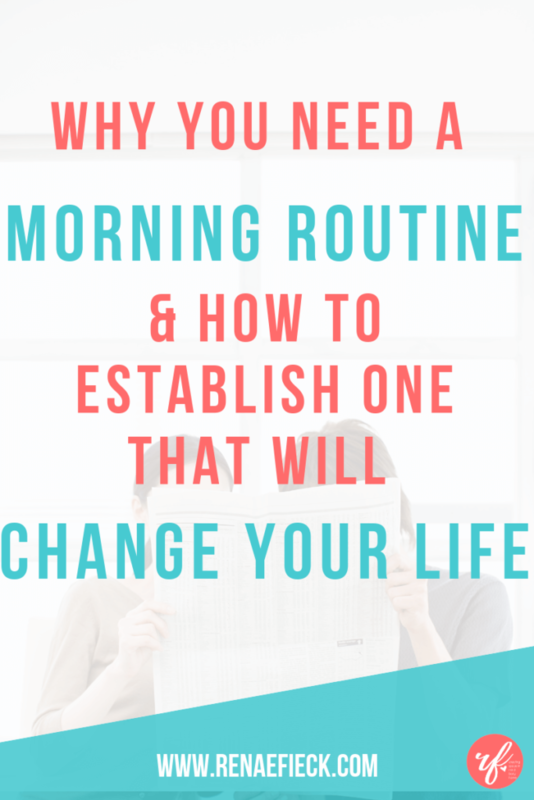 The nitty gritty of why you need one and what you need to have as a part of your morning routine. The most successful people in the world are early risers. I think that it’s not necessarily just because they’re successful that they rise early, but that they’re onto something. 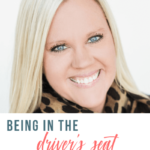 They understand that when you set a tone, have a plan, and you’re intentional with your morning, that intention is going to carry out throughout the rest of the day. It’s going to shape the way you feel. You’re going to be more centered, you’re going to be more grounded. As you practice this intention each day it’s going to compound on the next day. Each day adds up and ultimately changes your life. Your life has the power to be completely different. All in the single moments of the earliest part of your day. But what does it look like on a practical level? Why would we need a morning routine if we’re not mega CEOs and we’re just stay at home moms taking care of our home or working part time and balancing the chaos of day to day raising kids? When you rise and you set the tone for the day, you’re putting yourself in a proactive position rather than reactive position. For the very get go, you’re going to be more mindful and more aware. You’re going to be more peaceful and centered. If you’re constantly reacting and trying to keep up the rest of the day, you’re going to be quick to snap, quick to feel overwhelmed, and let’s just forget about being patient. Being proactive empowers you to change the way you interact with your kids. 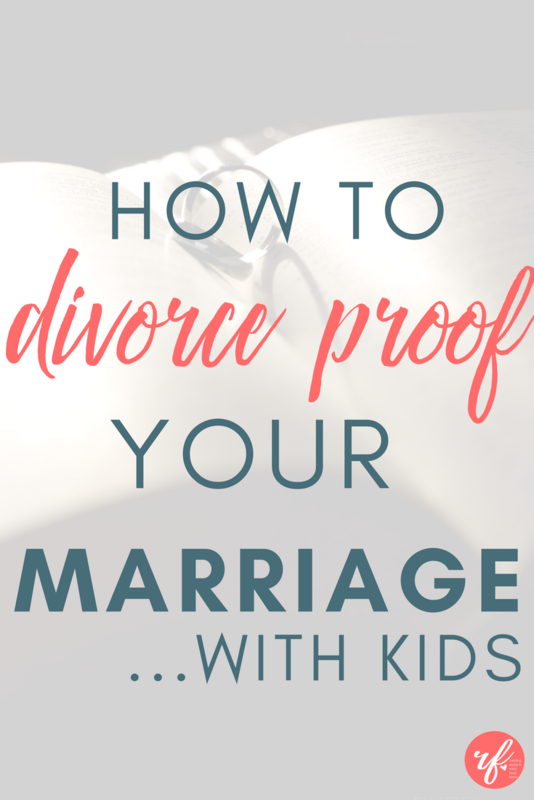 It’s going to shape the way you parent and you connect with your spouse. If your kids wake you to screaming, yelling and fighting, you’re immediately waking up in a reactive state. You’re prone to feeling a little more agitated, irritable, or frustrated. Rather, if you woke up even just 10 minutes before they woke up and you were really wise with how you sent that 10 minutes, you’re already in a place to be proactive. It will enable you to be more present and intentional when you respond because you have already filled your cup. You’re going to be more mindful. You’re going to be more patient. You’re going to be more aware. Yes, you can come back from a rough morning. Yes, you don’t have to be stuck in that negative mood or that negative attitude for the rest of the day, but it’s so much harder than if you’re intentional with those first few minutes of the day. The morning time should be held so sacred because what you do in that first little bit of the morning is going to fuel the rest of your day. The first few moments and thoughts have the power to shape the rest of your day. You shouldn’t be grabbing for your phone or looking at the list of to do’s that you have coming up. You shouldn’t be checking your email. These moments are critical. I’ve come to realize that my morning routine is super powerful and it’s super important. And if I don’t have it, I know that the rest of my day is going to pay for it. When you add in other variables of kids whining and kids complaining, you’re energy and patience is going to be tried. If you’re starting your day from a full place, you’re going to respond in a completely different way than if you’re already feeling run down. I probably should have prefaced this already, but I’m going to just say it now. I am inherently a nighttime owl. I would rather stay up late then get up early in the morning. I am not that person that just springs out of bed in the morning ready and bushy tailed and ready to go. That is not me. So in sharing that, I’m sharing with you that if, if you are not a morning person, I completely understand and I completely get it. But that does not let you off the hook. Once you start to realize the power in rising early, you’ll do what it takes to get up and find the time. This time is restorative. It’s soul filling. Space and time to reflect. Journaling, praying, meditating. It’s all good. Find what works for you. Maybe it’s just sitting to drink a cup of coffee. But allow yourself time to slow and be still. You need space to process and feel what’s going on inside of you. What hasn’t had a chance to surface inside your mind or your heart because you’re too busy going from one thing to the next? What are you worried about? What are you excited about? What are your hopes and dreams? Seriously….just let yourself begin to feel. What’s on your list or calendar for the day? What do you have that you need to give your attention to? Where do you need to maybe redirect or shift your time? Where are you going to make time for your priorities on a daily basis? Where can you create space to be intentional with your kids? What is going to be needing your attention and your time today? When you stay focused on your calendar, you can have significantly more intention with where your time is being spent and ultimately what your life becomes. I have two different ways that I fuel myself. One is through reading a book that’s inspirational or personal development or my Bible or a combination of all of the above. Being able to read first thing in the morning and filling my heart and my mind and my soul with really positive and uplifting, encouraging, inspirational things keeps me in an elevated high vibration state the rest of the day. The other thing is to fuel my body with a workout. Working out is not about necessarily losing weight or looking a certain way, but it’s about seeing my body as an engine that’s running. It’s the engine that’s fueling my passions and my day and the amount of me that I can give to those things that matter the most. The amount that I can give to my kids, the amount that I can give to my work and my passions. All of that requires my physical body. If I’m fueling that engine and taking care of it on a daily basis, it’s going to enable me to do more of that which I love. I don’t have to leave for the gym. There’s a lot of variables in my life that would limit me going to a gym or going for a run because I have my kids. Being able to work out at home for 20-30 minutes while they’re still sleeping is super powerful for me. (This is what I use to workout from home). How long should a morning routine be? Overall you can see my morning routine is probably on the range of about 45 minutes to an hour. That is my ideal time. I can sit as long as I want reading a book, I can sit as long as I want journaling. And then I still have 20 to 30 minutes to work out. But that doesn’t necessarily mean yours needs to be. Honestly, first thing in the morning is probably the only time that my house is actually quiet. Being able to sit and enjoy that quiet in peace and to start my day with that is really, really, really beautiful. It’s one of my favorite parts of the day. If waking an hour feels incomprehensible, I totally get that. Focus in on maybe 10 minutes or 15 minutes or whatever that timeframe that seems reasonable and possible for you. This is your morning routine. You want to to be something that brings life to you. I’m a mom and I have kids. So do you think my morning routine goes seamlessly? Absolutely every single day. Heck No! There are so many mornings where my kids wake up when I’m trying to journal or they wake up when I’m doing my workout. Even this morning, my youngest woke up almost immediately after I woke up at 5:15am. But I challenge you to still be intentional with your morning, no matter what it might look like. It might look like mine did when I snuggled with my daughter while I wrote in my journal. It might look like incorporating your kids into the routine as well. I think it’s really powerful to help teach your kids that this is an important part of their day and this is an important part of your day. You have the opportunity to be the role model for them. Someday when they grow up and they become parents too, they won’t feel exhausted and wiped out and depleted, because you have modeled to them the tools and strategies they need to take care of themselves. Don’t underestimate the value of your morning, even if you can’t get this time totally by yourself. I give my kids a book. I give them a Bible if they’re going to be on the couch reading with me so that they can have their own quiet time too. I tell them that it’s very important that mommy gets her time to read and her time to pray and her time to spend reflecting and that it’s important for them to do it too. The key ingredient is intention. You’re starting your day with focus. 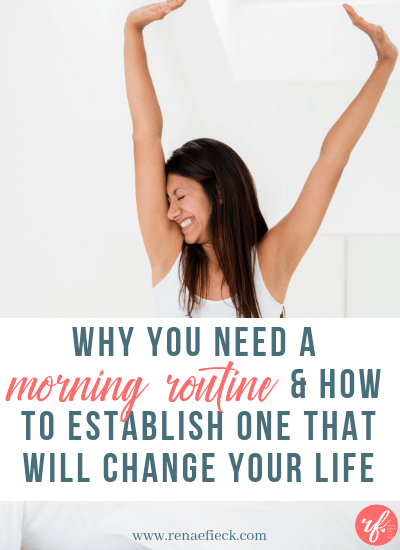 Maybe tomorrow your morning routine isn’t waking up super early or any earlier at all. But at that moment you wake up… that moment your eyes open or that moment that your cognition comes into play, that the first few thoughts of your morning, you start it with gratitude. You make your first thoughts of the day about the amazing things that you have. You can find gratitude and gratefulness no matter what your life circumstances. Oftentimes mornings are chaotic. There are lunches to be made and there are people getting dressed and you’re trying to get people out the door. Everybody’s shuffling and everybody’s bustling. It can be a really stressful and overwhelming part of the day. So make it an intention to not be on your phone. Don’t check your email first thing in the morning. Don’t be bombarded with social media. Allow yourself to be focused and intentional right where you’re at. When you’re fully present and not thinking about 100 million things, it will decrease your stress level. Then when you’re past that point of getting everybody shuffled and often to the places that they’re supposed to be going, then you can come back and focus in on your email, to do list, or wherever you need to be. We have GOT to stop multitasking through our days! If you’re looking for a little bit more guidance in how to get this morning routine started, I have put a journal up over here. 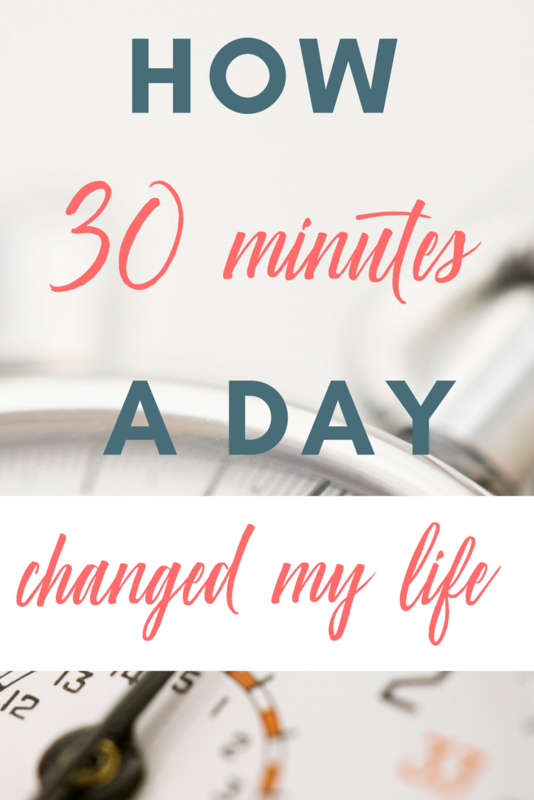 It has all of the pieces that I’ve used to help change my life and to set that intention and to really create a life I love. It incorporates reflection, planning, taking care of my body, taking care of my mindset, making sure I’m honing in on my goals, and that I’m focusing on the things that matter the most for me. I want you to wake up tomorrow with a new sense of intention. I want you to have a plan for tonight. When you go to bed tonight, you know that in the morning you’re going to wake up and you’re going to focus on those positive thoughts and that gratitude. You’re going to spend time journaling and really filling your cup first. Because if you fill your cup first thing in the morning, it will carry out over the rest of the day. You will feel more full and able to give more throughout your day than if you start your day half empty. 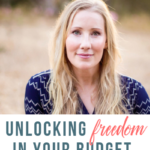 The More than Mom Summit is the collection of over 20 women sharing with you their best strategies and secrets on how they’ve let go of mom guilt, simplified their day to day, and found more joy in the everyday moments. You DON’T want to miss it! The Create a Life You Love Journal is the key pieces and steps that have helped me transform my mornings.